Homemade potato tots, shredded potato, cooked until crisp on the outside and fluffy inside. 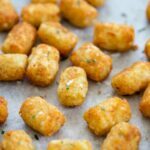 These homemade potato tots have just 4 ingredients (well 5 if you count salt) and are super simple to make. 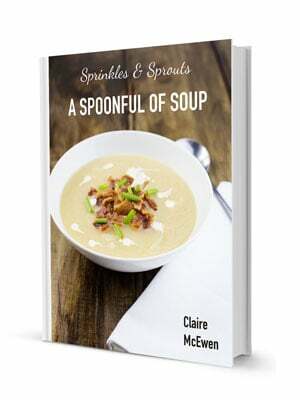 And keep reading for the best part of this whole recipe!!! I am loving my potato posts, I mean what is not to love? Potatoes are delicious and great value. AND kids love potatoes. That is definitely the case with today’s recipe. 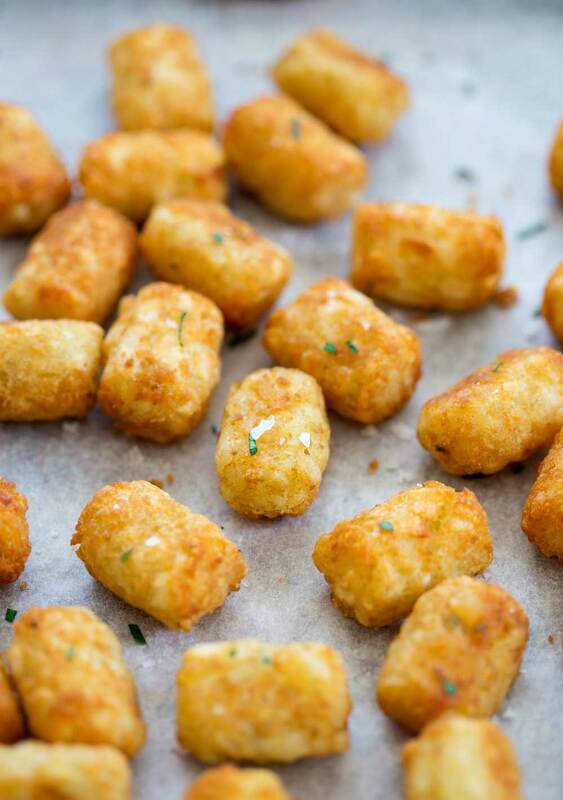 Kids and grown-ups love potato tots. Dipped into some ketchup they are a dinner time treat. 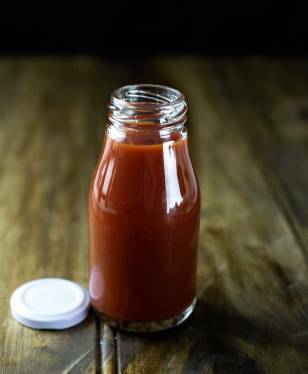 Did you see my homemade ketchup recipe? Homemade tots and homemade ketchup. Perfect! A few weeks ago, Stew had to work on a Sunday. Early on a Sunday!!!! We had to get him to the station by 7am!!! Mr 8 was at a sleep over, so Mr 5 and I dragged ourselves out of bed, drove Stew to work and then started heading home. I was a bit on the grumpy side, no coffee does that to me, and Mr 5 was hungry. So on the way home, we went through the coffee drive-thru Extra large latte for me and a small cup of potato stars for Mr 5. As soon as I was handed the cup, I knew I had made a mistake. They looked so good! No way a small cup was going to be enough! Then I ate one!!!! They were crispy on the outside, fluffy on the inside, glistening from the fryer but not at all greasy and sprinkled with chicken salt. I begrudgingly passed the cup to Mr 5, took a swig of my coffee and drove back around to the window and ordered a cup for myself! Just writing about these little stars is making my mouth water. But I have a problem, well actually I have two. Firstly I cannot go to the coffee drive-thru all the time and pay $5 for a cup, secondly I am certain these are extremely processed. Great as an occasional treat, but not something you can justify regularly. I bet you can guess where this story is going 😉 I came home and started planning how I could make my own mini stars. My theory was they are really only a star shaped hash brown. Not too difficult to reproduce, (I make hash browns a lot) or so I thought. Turns out it is actually quite hard to form hash browns into star shapes! I did manage it, but only with a very fiddly step of freezing the potatoes, cutting out stars with a cookie cutter and deep frying them to crisp the outside and help them keep the shape. It worked, but who wants to go to all that effort! So I gave up and just made balls I know that is admitting defeat, but the stars weren’t user friendly. The potato balls were an instant hit and Mr 8 said they were like potato tots. I claimed that as a win and the next time I made them, shaped them into the perfect tot shape. 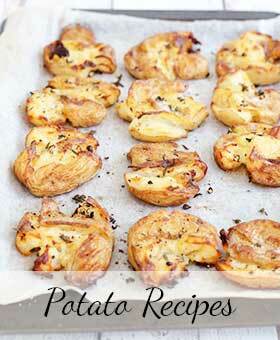 Yet again they were demolished and I knew I had a winning potato recipe, perfect for my potato recipe collection. I have made these a lot in recent days! I have added so many different variations of herbs and spices and the boys and I keep coming back to the basic recipe, baked or fried it is still our favourite. I have given instructions for both cooking methods. If pushed I to choose I would go fried for flavour and crust, but baked for ease. So pick whichever works for you. Both are delicious and both are better than buying a bag of frozen tops. AND THE BEST BIT!!!! Once you have formed these, you can fry them to get them crispy and then freeze them. Then when you want to eat them, just cook in the oven as you would shop bought frozen tots!!! Oh yes, homemade frozen tots!!!!! Homemade potato tots, shredded potato, cooked until crisp on the outside and fluffy inside. 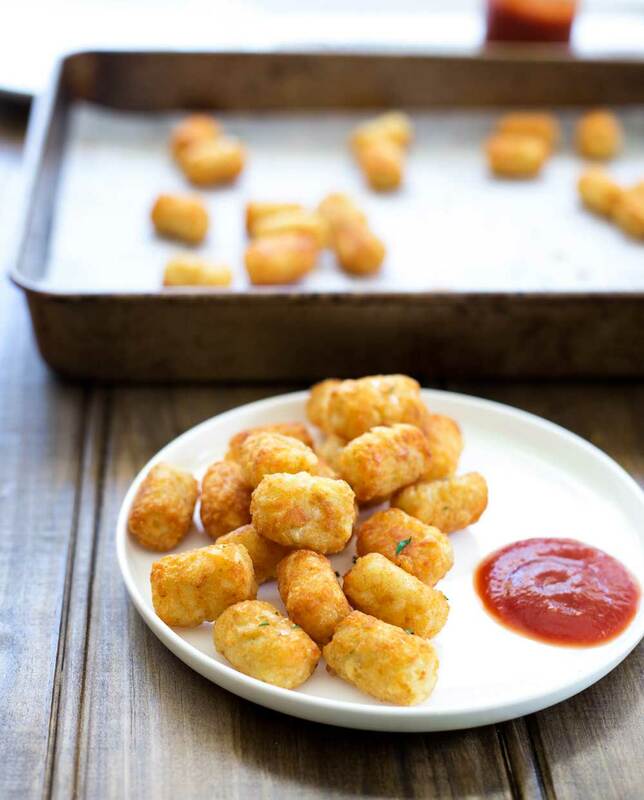 These tots have just 4 ingredients (well 5 if you count salt) and are super simple to make. Peel the potatoes and remove any eyes, cut them in half. Bring a large pan of water to the boil and then cook the potatoes for 5 minutes. In a large bowl mix the flour, salt, onion powder, and paprika until well combined. Add the potatoes to the flour mix and stir until well combined. 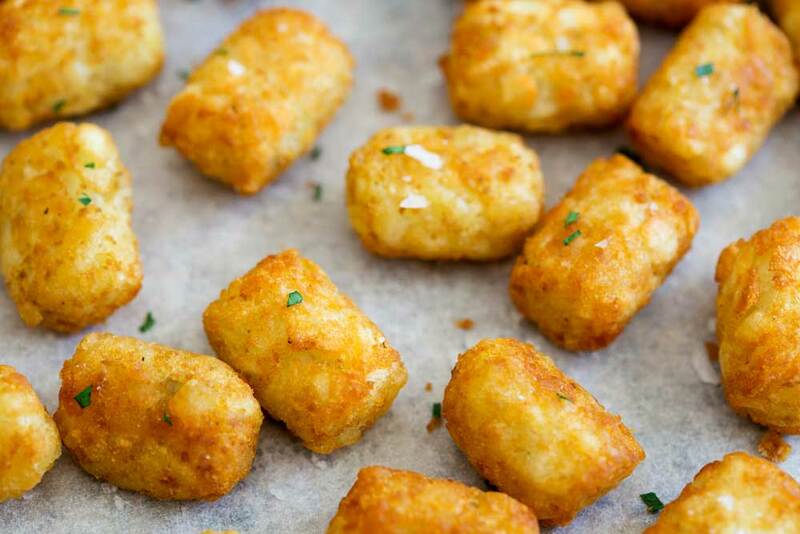 Generously flour your board then take a large handful of the mixture and gently roll it into a sausage shape, cut the sausage into small tot sized pieces and set aside whilst you finish the remaining tots. Heat the oil in a large saucepan until a small piece of potato starts to sizzle gently. 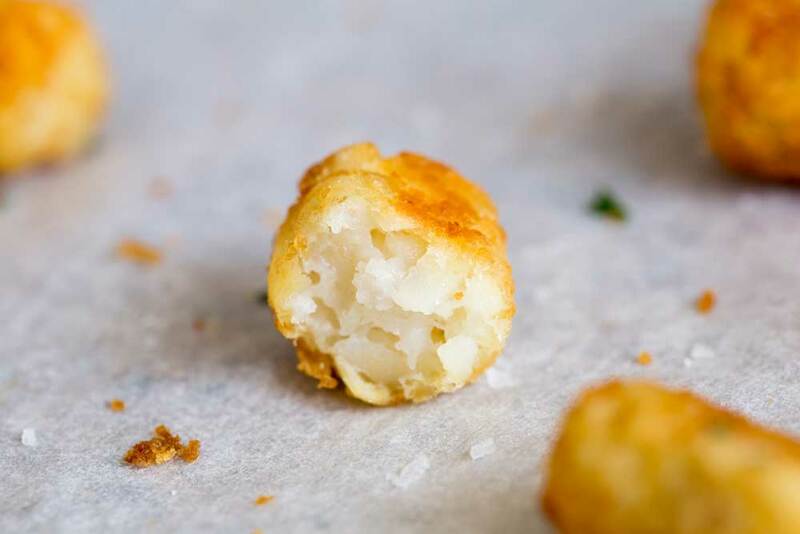 Fry the potato tots for 3 minutes until crispy. You will have to work in batches. As one lot come out tip them onto some kitchen paper. 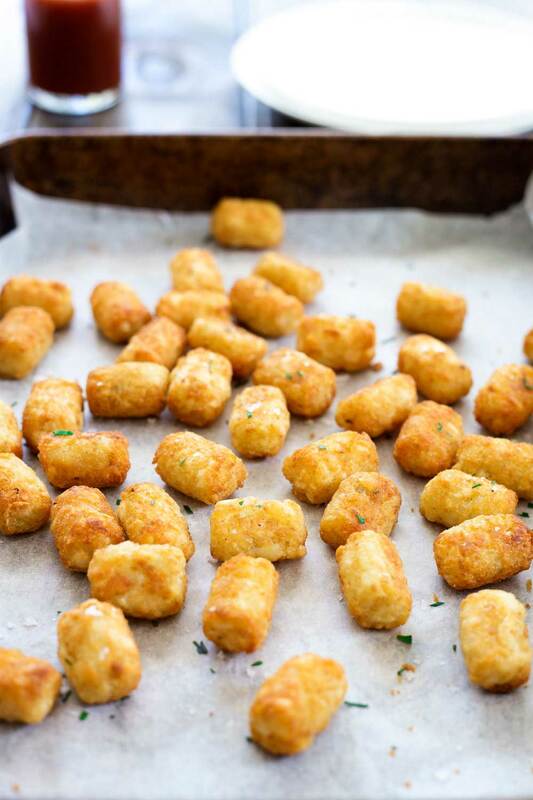 Line a baking sheet with cooking paper and arrange the tots so they are in a single layer. Bake for 10 minutes until soft in the centre and still crispy on the outside. Pre-heat the oven to 200ºC. Line a deep roasting tin with tin foil and then a layer of cooking paper. Place it in the oven to heat up. Pour 3 tablespoons of oil into your tin and then add the tots. Roll them around to coat and bake for 15 minutes until crispy and cooked through. You want a non-waxy potato. I use the sebago but king edwards or russets would be a great choice. Lay the fried tots out in a single layer on a lined tray and place in the freezer for 3-4 hours until solid. Transfer to a zip lock bag and freeze for unto 4 months. To reheat cook for 20 minutes rather than the 10 minutes in the recipe. Just curious…what kind of potatoes? I can’t wait to make these today! You want a starchy potato that has a fluffy inside when cooked. I use Maris Piper, Dutch Cream, Classic Idaho or Russet Potatoes. Can I skip the baking and just fry the tots? I Tez, you can definitely skip the baking stage and just fry them until cooked through. I hope you love the potato collection. Thank you Sara, I agree they are definitely addictive!!!! oh just pass me that pan, I would love to eat all of them!